Imagine traveling by train while seated at an elegant dining car table savouring dishes prepared by a world famous chef. 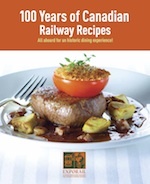 Exporail, the Canadian Railway Museum, invites you to discover the kind of cuisine CN, CP and Via Rail Canada have been serving passengers for the last 100 years. These pages contain 90 carefully selected and magnificently illustrated recipes, including appetizers, soups, salads, main dishes of meat, poultry and fishs and of course- desserts. An additional section offers a menu designed to introduce children to fine food. The book explores the origin of railway food services in North America and brings this history to life through several archive documents and photos from the Exporail collection of tableware. GREAT recipes and a nicely put together book. Interesting to see what was served in the great days of rail travel. The Mulligatawny soup recipe CPR 1913) is worth the price of the book alone, but the biscuits recipe (CN 1913) is a good one too.